The intervertebral discs serve as your spine’s shock absorbers. Growing older, trauma, injury, and wear and tear can change disc strength, resiliency and structural integrity. 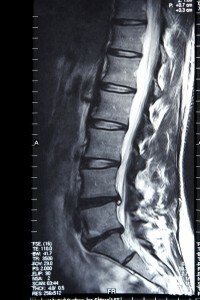 Degenerative disc disease (DDD) is common in adults 50 years of age or older. Possibly, a misnomer, DDD is not actually a disease but a condition that develops in people as they normally age. Some people who have DDD do not know they have it. They may only become aware of the condition when examined for another health problem. How does DDD cause a disc to change? Disc structure and function can be adversely affected by trauma, injury, repetitive movement, improper posture, poor body mechanics, or being overweight. These things subject your spine to abnormal stress, some of which can be controlled or avoided. Each disc is composed of a sturdy tire-like annulus fibrosis that encases a gel-like interior called the nucleus pulposus. Endplates anchor each disc in place between two vertebral bodies. Your body changes and slows down as you age. Old, worn out cells are not replaced as quickly as during youth. The cells in your discs change too. Sometimes degeneration is accelerated by injury. A cascade effect can develop; in other words, one structural change leads to another. Disc height can be reduced and cause nerve compression and pain. Bone spurs, bony overgrowths called osteophytes develop. These can cause nerve compression, such as spinal stenosis. Some people have no symptoms; they are asymptomatic. However, DDD often is progressive, which means symptoms gradually develop and may worsen. Pain and symptoms may spread or radiate. Cervical radiculopathy and sciatica (lumbar) are examples. Consult an expert about your neck or back pain, pre-existing or changing spinal disorder. An accurate diagnosis is essential to an effective and successful treatment plan. Your medical history and physical and neurological examinations are very important. You and your doctor discuss your symptoms and treatments tried. The doctor tests your reflexes and evaluates you for muscle weakness, loss of feeling, and signs of neurological injury. Diagnostic testing helps the doctor confirm your diagnosis. A simple spinal x-ray will show collapsed disc space. X-rays taken while you are bending forward, backward, or to the left and right reveal if your spine is unstable. CT and MRI are sensitive imaging tools that reveal disc and endplate changes. Lumbar discography uses a special fluid dye injected into one or more discs under real time x-ray (fluoroscopy) to verify damage (e.g., crack) and pain origin. You may be a candidate for a minimally invasive spine surgery. Sometimes spinal stabilization and fusion are necessary to stop the spine from moving or help alleviate progression of symptoms. We hope this information about cervical degenerative disc disease has answered your immediate questions. Remember, your doctor is your most valuable source to answer your questions about symptoms and your healthcare.